As the heart of your home, you r kitchen’s aesthetics and functionality set the tone for your entire house in Bluffton, South Carolina. If your kitchen is damaged, drab, or outdated, remodeling can have an incredible impact on your home’s overall warmth and style. But who should you trust with this important home investment? The kitchen renovation experts at Porch Outfitters. At Porch Outfitters, we understand how important it is that you get exactly what you want from your kitchen remodel. We’ll begin our process with an in-depth consultation process so that we can gain an understanding of your needs, budget, and aesthetic preferences. We’ll then make recommendations based on what we learn. After we’ve created a design that you love, our team of highly experienced and trained technicians will get to work building the kitchen you always dreamed of having. 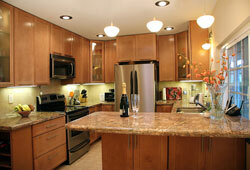 We strive to provide each of our customers with the best possible value for their remodeling dollar. To that end, we offer our customers only the highest quality materials that fit with their needs and budget. For example, we can install custom cabinetry, countertops made from a variety of natural stone, and high-performance flooring that requires minimal maintenance. If you’d like to learn more about the benefits of having Porch Outfitters handle the kitchen renovation in your Bluffton, SC, home, contact us today.